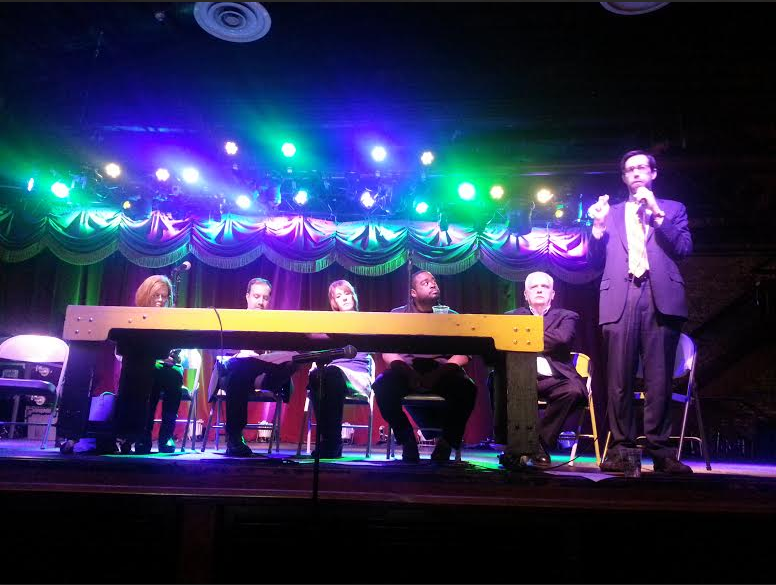 Today at 11AM, the community of local business owners, commuters, organizations, elected officials and concerned citizens met at Williamsburg’s Brooklyn Bowl to discuss the impact of the possible long-term L train shutdown. Earlier this month, Gothamist broke the news that the L train tubes in the Canarsie tunnel, which connects Manhattan and Brooklyn, need extensive repairs of the damage caused by Superstorm Sandy. These repairs are currently projected to take up to three years. The prevailing notion among the speakers as well as the audience at today's meeting was that a long-term shutdown of the L train would be lethal to the local business, and the pressure put on the alternative methods of transportation would be immeasurable. Another common cause of frustration was that nobody seemed to fully understand what exactly the extend of the damage in the Canarsie Tunnel was; what exactly needed to be repaired; and what the alternatives to the L train shutdown were, if any. Elected officials sent the first communiqué to the MTA on January 25, in which they stressed the adverse effects of the proposed L train shutdown. They also demanded a meeting with the MTA in order to discuss their concerns and to work together on a mitigating plan. The meeting with the MTA hasn’t happened yet but an MTA representative, Andrew Inglesby, was present today to “primarily listen,” and wasn't at this time able to answer the questions of the community. He said there currently is no definitive plan that can be released to the public. He promised to take the comments to the MTA in order to help formulate their plan. “The problem is that they need to do Sandy repairs on every tube; they’re looking for a plan,” Mr Inglesby said. “The reason why we haven’t come to the community is that we’re looking into mitigating options.” He said that there is no timetable for this yet, and the information, which surfaced about the shutdown was a press leak. Community activist and a former owner of Teddy’s Bar in Williamsburg, Felice Kirby who presided the meeting, compared the threat of the long-term L train shutdown to the 1988 situation when the city proposed to tear down the Williamsburg Bridge because “nobody was going to Brooklyn anyway.” It was thanks to the community activism, talent and investment of the community that this luckily never happened. The business owners in the audience stressed that the L train is absolutely vital for their survival. “MTA has to explicitly state what options are there to repair the L; they can’t just dictate us,” said an audience member. “None of the contingencies like buses or Uber can replace the L. This is a very unique community that is dependant on the line,” he concluded. Business owners also brought up that the uncertainty regarding the future of the L train is already causing them trouble. A representative from Brooklyn Winery said that she is booking events year in advance and the clients are already raising the questions. 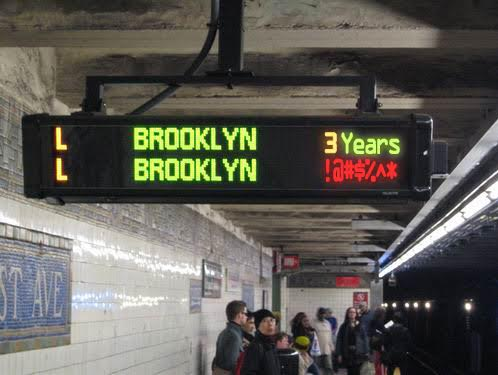 “The L train represents the future of the city,” said a man, a resident of Williamsburg of 30 years. “A lot of great companies like Kickstarter, Amazon, or Livestream are coming here and they rely on the L train for their employees to come. This doesn’t impact just nightlife; it is the economic future of the entire city.” He also pointed out that the MTA is a public entity that has a fiduciary duty to the citizens of the city and the state. “Engineering should be at the service of the people—not the other way round,” he concluded. Assemblyman Joseph R. Lentol proposed that an independent transit advisor is appointed and paid from the pocket of the MTA. “If there is any way on earth for this not to happen as a long-term shutdown, they need to do this,” said state senator Daniel Squadron. State senator Martin Malavé Dilan is a member of the Transportation Committee, which oversees the MTA. He said that they have a 2016 state budget on the table currently, which includes the budget for the MTA. The budget vote is planned on March 31. Mr Dilan also said that it could be a year or a year and half until the shutdown. Felice Kirby concluded the meeting with actionable items to create various committees within The L Train Coalition. Brooklyn Chamber is drafting another letter to the MTA incorporating the notes from the meeting. Ms Kirby acknowledged that the time of the meeting--11am--wasn’t ideal for parents and commuter communities. The second meeting will be held on a February Wednesday at the premises of Community Board 1.